Throughout the 1960s and 1970s, nearly every working director in the Italian film industry made a giallo, a western, or both. Luigi Bazzoni was no exception. Bazzoni started his filmmaking career as an assistant director on several features in the late 1950s and early 1960s and directed a couple of shorts of his own which were released in 1963. He then directed five feature films released between 1965 and 1975: The Possessed (aka La donna del lago, 1965), Man, Pride and Vengeance (aka L’uomo, l’orgoglio, la vendetta, 1967), The Fifth Cord (aka Giornata nera per l’ariete, 1971), The Short and Happy Life of the Brothers Blue (aka Blu Gang e vissero per sempre felici e ammazzati, 1973) and Footprints on the Moon (aka Le Orme, 1975). The degree to which each film fit into its respective genre varied, but Bazzoni was clearly not interested in fulfilling genre expectations. Each of his features confounded expectations in different ways, and each of them displayed a level of technical excellence frequently missing in other genre cinema of the time. Having only made a handful of features, at least one of which has been very difficult to track down for modern viewers, Bazzoni is frequently overlooked in discussions of Italian directors. However, his work is distinct and remarkable enough to deserve a closer look for fans of Italian cinema in general and 1960s and 1970s genre film in particular. Virna Lisi in “The Possessed” (1965). Bazzoni’s directorial debut was The Possessed (aka La donna del lago, 1965), based on the 1962 novel La donna del lago by Giovanni Comisso. Co-directed with Franco Rossellini (nephew of Roberto Rosellini) and co-written with Rossellini, Franco’s father Renzo and Giulio Questi (writer/director of 1967's Django Kill… If You Live, Shoot! and 1968's Death Laid an Egg), The Possessed is a stylish black and white murder mystery that calls to mind both Mario Bava’s prototypical giallo The Girl Who Knew Too Much (aka La ragazza che sapeva troppo, 1963) and the gothic surrealism of Alain Resnais’s Last Year at Marienbad (1961). Peter Baldwin stars as Bernard, a writer who returns to the small resort village on a lake where he spent a previous summer. He is looking for both inspiration and the young woman, Tilde (Virna Lisi), with whom he had fallen in love during his previous stay. He finds the town virtually deserted, constantly overcast and desolate. Bernard stays in the hotel where Tilde worked, only to discover that she has died and no one is willing to discuss the matter any further. Bernard takes it upon himself to investigate Tilde’s death in hopes of exposing whoever may have been responsible, but as he digs deeper into the secrets of the town, he learns Tilde may not have been the woman he thought she was. The Possessed superficially resembles a giallo with its murder mystery storyline, but Bazzoni and Rossellini give the film a bleak tone that borders on horror. Bernard has dreams of Tilde, and these dream sequences display striking visuals that stand in stark contrast to the more straightforward approach the film takes to Bernard’s waking life. But even the scenes of his amateur investigation have an ominous tinge of the inexplicable, with Bernard walking the empty streets of the virtually abandoned resort town. His interaction with the townspeople reveal almost all of them to be highly eccentric, potentially dangerous, or both. Everyone seems to be sleepwalking through this story, adding another layer of unreality to the film. Bazzoni and Rossellini expertly evoke a thick atmosphere of dread that intensifies as Bernard closes in on the truth behind Tilde’s death. The finale is unsettling, giving the audience answers but not the typical satisfaction of a mystery solved. The dark cloud that has hung over Bernard and the town seems inescapable; the truth ultimately offers no real comfort here. The Possessed was released on Italian-language DVD by Sinister Films in Italy in 2013 under its original title, La donna del lago. The film has never been released on home video in the United States, making it somewhat difficult to track down for American viewers. Tina Aumont and Franco Nero in “Man, Pride and Vengeance” (1967). Man, Pride and Vengeance (aka L’uomo, l’orgoglio, la vendetta, 1967), Bazzoni’s second feature, stars Franco Nero, Tina Aumont and Klaus Kinski, and by all outward appearances is a typical Spaghetti Western. However, the film is actually a melodramatic adaptation of Georges Bizet’s opera Carmen in Euro-Western drag. Nero stars as José, a young soldier who becomes involved with the passionate and unstable Carmen (Aumont). José and Carmen’s volatile relationship leads to José committing a terrible crime, deserting the army and going on the lam. Camen later convinces him to take part in a stagecoach robbery with a gang led by her husband Garcia (Klaus Kinski). As anyone who has seen Klaus Kinski in a film before might guess, the heist ends badly. Carmen disappears and José searches for a way to escape to America. Unfortunately for him, before he can flee he crosses paths with Carmen once again, leading to a tragic finale. Man, Pride and Vengeance uses the same desert locations as many of its Western film contemporaries, but instead of standing in for frontier America they are playing themselves for once. Most of the acting in the film is pitched at near hysterics, with Nero and Aumont spending a good amount of their screen time screaming severely overheated dialogue in each other’s faces. There is very little in the way of the action associated with the Western. This is a heavily character-focused film that just happens to superficially resemble Westerns produced in Italy at the time. The film looks good, but the somewhat cold technical precision of The Possessed and (especially) The Fifth Cord is less a focus than the intense performances Bazzoni can wring out of his actors. While it has not been previously available on home video in the United States, Blue Underground is preparing a Blu-ray release of Man, Pride and Vengeance for May of 2015. It has been released on home video in Europe in VHS and DVD formats, and the DVD versions are readily available. Pamela Tiffin in “The Fifth Cord” (1971). The massive popularity of the giallo resulted in a constant stream of these lurid mysteries coming out of the Italian film industry in the 60s and 70s. Bazzoni’s third feature, The Fifth Cord (aka Giornata nera per l’ariete, 1971), is unsurprisingly one of the most distinctive and visually striking films in the genre. While many people associate the giallo with stylish camera work and vibrant colors — thanks probably in large part to the work of Dario Argento, arguably the most well-known giallo director — most of the actual films in the genre are comparatively straightforward. Even Argento’s own early giallo The Cat o’ Nine Tails (1971) looks for the most part like a made-for-TV murder mystery movie aside from some inventive camera work at the end of the film. The story in The Fifth Cord is fairly standard giallo stuff: Alcoholic journalist Andrea Bild (Franco Nero) is assigned to cover the attempted murder of a socialite, but when the police discover Bild was at the same bar the woman left just before the attack, he becomes a suspect. Forced to perform his own investigation, Bild enters into a deadly game with the assailant, who begins murdering a new victim every week and leaving an ominous message behind: a glove with fingers cut off corresponding to the number of victims. Bild must uncover the identity of the killer before he, his girlfriend, his ex-wife or his young son become the final victim. If he can manage to stay sober long enough to make sense of the information he gathers along the way, that is. 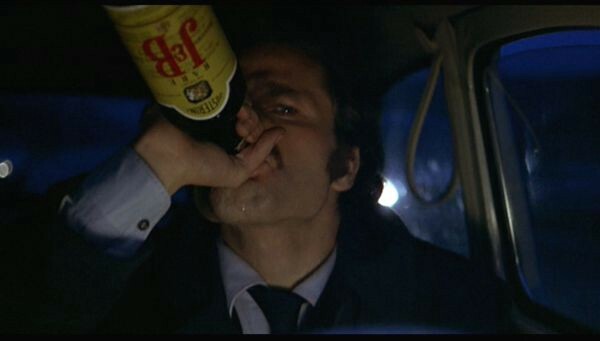 Franco Nero polishes off a bottle of popular giallo signifier J&B as he drives in “The Fifth Cord” (1971). Based on a novel by D.M. Devine, The Fifth Cord sticks close to the established tropes of the giallo formula and features a score by Ennio Morricone, who had already scored well over a hundred films at that point in his career including a number of famous gialli. 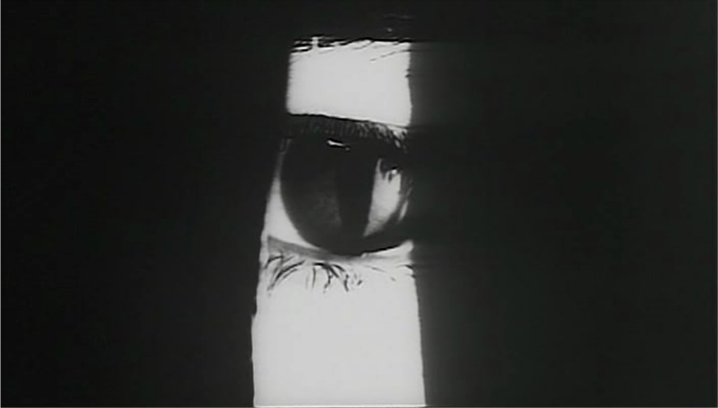 Where the film distinguishes itself is in Bazzoni’s visual approach. Shot by Vittorio Storaro, who went on to win Academy Awards for Best Cinematography for Apocalypse Now (1979), Reds (1981), and The Last Emperor (1989), The Fifth Cord looks more like a Stanley Kubrick film than a typical giallo. 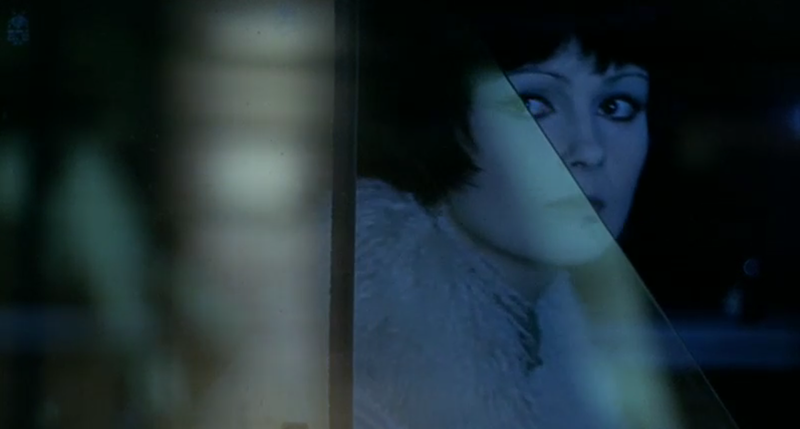 Bazzoni and Storaro use stunning, precise frame composition and color to give the film an icy technical sheen unique in the genre. There are many wide shots through which characters wander, the focus on the architecture and space around them suggesting a pointed isolation. Unlike Bazzoni’s previous films, The Fifth Cord does not feature any kind of overtly “artificial” acting (like the near-zombies of The Possessed or the overwrought histrionics of Man, Pride and Vengeance). The performances are solid, and better than many of its giallo contemporaries, but not entirely out of place in the genre. Instead, Bazzoni relies on the excellent photography (and an unusual judgment-free approach to the lead character’s severe alcoholism) to set The Fifth Cord apart from its peers. Blue Underground has released The Fifth Cord on DVD in the United States, and it was available for some time on Netflix Instant, making it by far the most well-known of Bazzoni’s films in the States. It is currently available on DVD and via VOD through Amazon and iTunes. It has been released on home video and VOD in Europe as well. 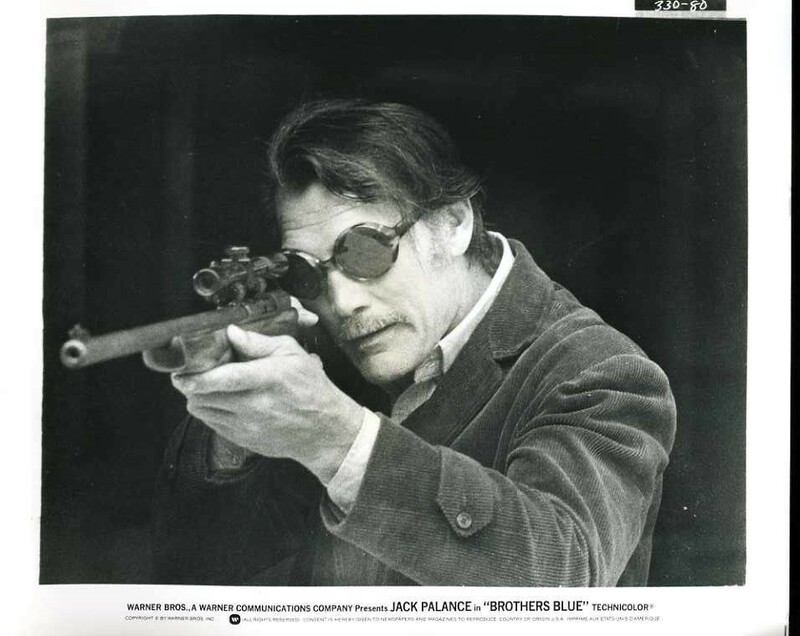 Lobby card for “Brothers Blue” (1973) featuring Jack Palance. Despite their distaste for rich bankers, the Brothers Blue seem keen to join them in capitalist luxury. After their young partner Teddy (Paul Jabara) is injured and captured by police and Frank (Maurizio Bonuglia) is banished from the gang for killing a storekeeper, the brothers and Kane’s girlfriend Polly (Tina Aumont) take off on a spree, stealing bags of cash and an automobile to head to the big city and live it up. Johnny eventually heads back to the Blue homestead and marries Jenny (Clara Mutschaewski), a young prostitute who earlier helped the brothers escape from a brothel by dressing the boys in drag. The reunited group strikes off to try and escape the relentless Hillman, but as the title of the film suggests, they are ultimately unsuccessful. By far the most difficult of Bazzoni’s features to track down, Brothers Blue was released theatrically by Warner Bros. in the United States. It does not appear to have ever been given a home video release anywhere in the world, the only available version being a poor-quality bootleg recorded on VHS from French television (complete with French subtitles). Why exactly this is the case is impossible to say; hopefully Warner Bros. may see fit to release a DVD of the film through their Warner Archive disc-on-demand or streaming video service. Presuming, of course, that they (still?) own the home video rights to the film. After Brothers Blue, Bazzoni made something of a return to the kind of haunted world of The Possessed for his next film. Footprints on the Moon (aka Le Orme, 1975) was based on a novel entitled Las Huellas by Mario Fanelli, with whom Bazzoni had collaborated on writing Brothers Blue (Fanelli also co-wrote this film). It stars Florinda Bolkan as Alice, a translator for the United Nations, who wakes up one morning from a nightmare in which an astronaut dies during a moon mission. Alice dimly remembers these images being from a film she saw years before. That day, she goes to her office and is told that she has missed three days of work. Having no memory of the preceding days, she returns home to find a few unsettling clues to the mystery of her lost time: a postcard from a resort town called Garma, an unfamiliar earring and a blood-stained dress. She goes to Garma to discover what happened during those days, only to find the off-season town nearly deserted. Alice meets a few strange locals and is befriended by Paola (Nicoletta Elmi), a young girl who initially mistakes Alice for someone named Nicole who Paola met just a few days ago. Some of the few people in the town claim to have seen Alice recently, too. The intensity of the recurring nightmare about the dying astronaut grows as Alice learns more about Nicole, who may have been a regular visitor to Garma. Alice’s search for the truth becomes increasingly opaque and frustrating, exacerbating the exhaustion she may have already been suffering due to the stress of her job. Like The Possessed, the ending of Footprints on the Moon offers no comfort to either its lead character or the audience; unlike The Possessed, it offers nothing like a concrete answer to its central mystery. While frequently classified as a giallo, Footprints on the Moon has more in common with similar low-key female-centered psychological thriller and horror films of the 1970s like Robert Altman’s Images (1972), George A. Romero’s Season of the Witch (1972), and John D. Hancock’s Let’s Scare Jessica to Death (1971). The focus in the film is primarily on Alice’s deteriorating emotional and mental state as she encounters constant challenges to her sanity. Giallo mainstay Bolkan (star of Lucio Fulci’s A Lizard in a Woman’s Skin, 1971, among many others) gives a strong lead performance, but her appearance as well as that of Nicoletta Elmi (Aldo Lado’s Who Saw Her Die?, 1972, and Mario Bava’s A Bay of Blood, 1971) and Klaus Kinski (in a cameo role as a scientist in Alice’s nightmares) leads some viewers to lump the film into the giallo genre. Regardless of what genre label one might want to give the film, Footprints on the Moon is as technically impressive as any of Bazzoni’s work. Shot once again by Vittorio Storaro, the film has a similar feel to The Fifth Cord, and while the story is much less straightforward than that movie, it does feel a bit warmer. The quiet streets and beaches of Garma are less alien than the stark urban landscapes in which The Fifth Cord takes place. 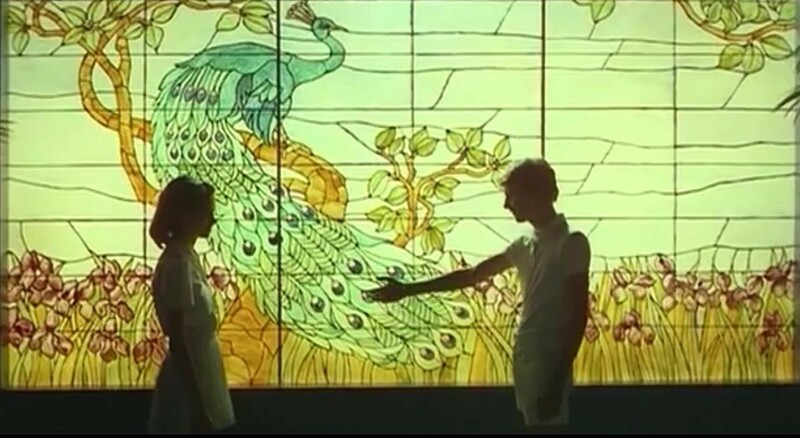 Some particularly memorable imagery involving characters silhouetted against large walls of stained glass appear to have been a direct inspiration for similar scenes in Hélène Cattet and Bruno Forzani’s kaleidoscopic giallo nightmare The Strange Color of Your Body’s Tears (aka L’étrange couleur des larmes de ton corps, 2013). It is entirely possible that Footprints on the Moon’s impenetrable plot was a major influence on that film as well. Shameless Films released Footprints on the Moon on DVD in Europe in 2009. That edition is still available. The film has never been released on home video in the United States, but as of this writing it is available for streaming through Fandor. After Footprints on the Moon, Bazzoni was not credited with directing another film until the 1990s. His hugely ambitious 15-volume documentary series on the Roman empire, Roma: Imago Urbis (1993), screened at the Metropolitan Museum of Art in New York in the museum’s Roman art exhibit. Bazzoni again worked with Vittorio Storaro, and the film featured music composed by Ennio Morricone. Roma: Imago Urbis has since aired on Italian television, but it has never been released on home video in the United States. Even in Italy, the film was only released in a huge set that is long out of print which collected all 15 parts of the documentary on a series of VHS tapes with accompanying books and reproductions of Roman coins. 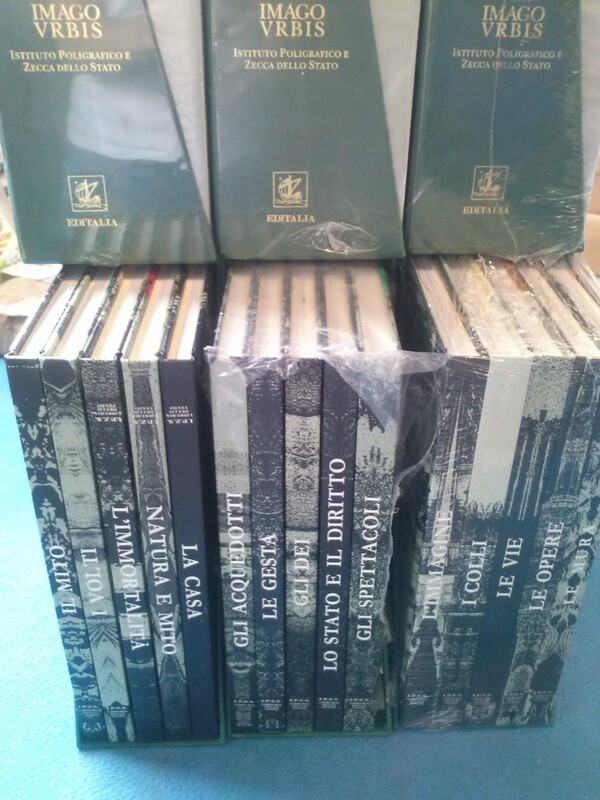 Photo of the “Roma: Imago Urbis” set from an Ebay Italy listing in April 2015. Bazzoni did not direct again before his death in 2012, although he did share a writing credit on a 2005 film directed by Andrea Bolognini, Raul — Diritto di Uccidere. Bazzoni had a handful of co-writing credits throughout his career, but none of those films have been released in the States and most of them are not currently available on home video even in Europe. The early films on which Bazzoni acted as an assistant director are somewhat more accessible on home video in Italy, but there are no English-friendly releases of any of those films. Bazzoni was an interesting and intelligent filmmaker, and it is deeply unfortunate that his work has fallen into such obscurity. Hopefully the upcoming U.S. release of Man, Pride and Vengeance will help stoke interest in the rest of Bazzoni’s films, and there is little doubt his reputation will grow as more cinephiles discover his work.